Very HIGH level of 'strangeness' about all aspects of the flight, passengers, luggage, etc. This was not IMHO just a non-state-actor terrorist action.....more likely a state-sponsored or at least group sponsored one by a group protected by a state sponsor. The investigation, so far, is as strange as the events - or apparent events. Pan Am 103 take II. The two men who apparently used the false passports purchased their tickets at the same time and at the same place. It seems they began their journey from Brussels [Gladio's, ....... I mean NATO's HQ city] via Amsterdam and on via yet unknown connections to this flight. (Reuters) - Employees of Freescale Semiconductor who were on a Malaysia Airlines flight presumed to have crashed were doing sophisticated work at the U.S. chipmaker, a company spokesman said on Sunday. One of the chipmaker's long-time competitors, Texas Instruments, tweeted on Saturday: "We extend our condolences to the families and coworkers of the @Freescale employees aboard Malaysia Airlines flight MH370." First they were 'Asian looking' now they aren't. And what are the chances of a passenger on a Malaysian airline traveling to China looking Asian anyway? What ever 'Asian looking' means. Genius! Why don't the stolen passports, which are registered in an Interpol data base, come up with an alert when used anywhere? They know everywhere I go and everything I read on the net but not this? Why aren't we seeing any CCTV of the boarding passengers at the airport? Another case of the missing video footage? Malaysian Airways confirmed the plane had lost contact with Subang Air Traffic Control at 2.40am (SAT) local time. Were steps made then to locate the plane at the time of disappearance and if not why not? Seems from the coverage that it was not until it didn't arrive at its destination that any steps were taken. Confusion mounted on Monday over the identities of the two passengers flying on stolen passports aboard missing flight MH370 after reviews of CCTV footage prompted a Malaysian official to describe them as resembling a black Italian footballer. Civil aviation chief Azharuddin Abdul Rahman told reporters in Kuala Lumpur that the men, who had been travelling on stolen Italian and Austrian passports, were "not Asian looking" and may have been part of a stolen passport syndicate. When prompted by reporters to describe the two men, Azharuddin said: "Do you know a footballer by the name of Balotelli? ", referring to AC Milan striker Mario Balotelli, who was born in Italy to Ghanaian parents. It was unclear if Azharuddin was suggesting that the men were of a darker skin tone or if they did bear any resemblance to Balotelli – who usually sports a mohican and diamond studs. He later explained that investigators were unable to determine the passengers' nationalities based on CCTV footage alone but added: "I think they are not Asian." The Boeing 777 carrying 239 people lost contact over the sea between Malaysia and Vietnam on Saturday. No distress signal was sent. China expressed its mounting frustration over Malaysia's handling of the investigation with the English-language Global Times — a government mouthpiece — saying Malaysia's response "was not swift enough". Beijing has sent 10 officials to Kuala Lumpur to provide assistance. "This incident happened more than two days ago, and we hope that the Malaysians can fully understand the urgency of China — especially of the family members — and can step up the speed of the investigation and increase efforts on search and rescue," foreign ministry spokesman Qin Gang told reporters in Beijing. 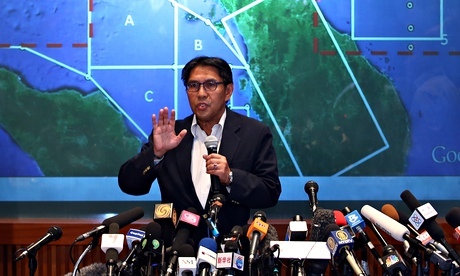 Civil aviation chief Rahman admitted that Malaysian investigators were "puzzled" over how the aircraft was able to just suddenly disappear. Earlier potential leads were dashed after it emerged that the oil slick spotted off the coast of Vietnam was caused by a ship and not an airplane, and the yellow "life raft" suspected to be from the airplane was actually a moss-covered cap of cable reel. However, another debris sighting, some 50 miles off Vietnam's coast, saw ships dispatched to the area to investigate, as Malaysia said it was doubling its search operations to 100 nautical miles, including parts of peninsular Malaysia, waters north of Sumatra, more of the South China Sea, as well as a section of the Malacca Straits. Some 40 ships and 30 planes, including teams from Thailand, Australia, the US, Philippines, Vietnam, China, Singapore, Indonesia and New Zealand, are currently aiding the Malaysians on search and rescue. "To confirm what really happened we need hard evidence — concrete evidence," Rahman said. "We have not found anything that appears to be objects from the aircraft, let alone the aircraft." Although Rahman said no protocols had been breached on the Beijing-bound flight, the Malaysian prime minister, Najib Razak, announced that all air travel security protocols would be reviewed and stepped up if necessary. The FBI is assisting Malaysian authorities in investigating what may have caused the flight to go missing at 1.30am on 8 March with 239 people on board. In another potentially bizarre twist to the story, the Thai travel agent who booked the tickets for the two men with stolen passports said the purchase had been arranged through an "Iranian contact". The clients were looking for cheap flights to Europe, Benjaporn Krutnait of the Grand Horizon travel agency in the resort town of Pattaya told the Financial Times, adding that a "long-term business contact" who went by the name of Mr Ali had asked her to reserve the flights, which were later paid for in cash by a friend of Mr Ali's. While there is as yet no reason to believe that Mr Ali, who Benjaporn described as a middleman, knew that the two men were travelling on stolen passports, the revelations are sure to further fuel speculation of foul play as a senior police official told Reuters that passengers armed with explosives and travelling on stolen passports had previously attempted to fly out of Kuala Lumpur's international airport. Thailand's Prime Minister Yingluck Shinawatra told CNN that Thai police were investigating the identities of the two men as the passports had been stolen from Thailand and were registered with Interpol's stolen document database. "We don't know about their nationality yet. But we gave orders for the police to investigate the passport users," she said. In Beijing, distraught families who have been camping out in the Metropark Lido hotel's second-storey ballroom finally met with Chinese government officials for the first time, during which the frustrated crowd began heckling the officials over the perceived lack of assistance. "Where have you been all this while?" shouted one angry passenger, while another yelled: "Tell us what the chances are of survival for the passengers!" Over 100 people at the hotel signed a petition demanding "truth" from Malaysia Airlines, CNN reported, as the carrier said it would fly out five relatives of each missing passenger to Kuala Lumpur. US-trained Chinese psychologist Paul Yin, who has been offering counsel to friends and family of the passengers, told the Guardian that "the uncertainty, really, is the most difficult thing to digest". "A rationalised explanation doesn't help them," he added. "Most of them are holding on to a thin ray of hope. Whether they believe it to be realistic or not, most of them are not letting it go." Flight MH370 had 227 passengers and 12 crew on board from 14 countries, two-thirds of whom were Chinese. It was scheduled to land in Beijing before disappearing from radars at 1.30am Kuala Lumpur time, roughly one hour after takeoff. How does this even work? Fingerprints and photos of two men who boarded the doomed Malaysia Airlines passenger jet are being sent to U.S. authorities so they can be compared against records of known terrorists and criminals. Photos maybe. But fingerprints of passengers they don't know the identity of and can't find on a jet they can't find? Some thing we are not being told here some where? Where did the finger prints come from? Fingerprints and photos of two men who boarded the doomed Malaysia Airlines passenger jet are being sent to U.S. authorities so they can be compared against records of known terrorists and criminals. The cause of the plane's disappearance has baffled investigators and they have not said that they believed that terrorism was involved, but they are also not ruling anything out. The investigation into the disappearance of the jetliner with 239 passengers and crew has centered so far around the fact that two passengers used passports stolen in Thailand from an Austrian and an Italian. The plane which left Kuala Lumpur, Malaysia, was headed for Beijing. Three of the passengers, one adult and two children, were American. Today Malaysia's Civil Aviation Chief Azaharuddin Abdul Rahman said officials had reviewed surveillance tape of the plane's boarding "from check-in right to departure." When asked about the two men who used the stolen passports, Rahman replied, "We confirmed now they are not Asian looking males." When pressed to describe them, he said indicated that one of the men is black. Do you know a footballer by the name of Bartoli? Do you know what he looks like?" Rahman asked. Reporters corrected him asking, "Mario Balotelli?" and asked whether the man with the stolen passport was black. Balotelli, who is black, is an Italian soccer player. Rahman refused to further describe the two men. U.S. authorities plan to run the photos and fingerprints of the two men against databases of known criminals and terrorists in hopes of finding a match, a senior official said. Another senior counter-terrorist official said that finding out more about those two men could be the key to understanding how and why the flight suddenly disappeared mid-flight Saturday. “Until we get more information on the two people using the stolen passports and ascertain whether they were involved, or they [search parties] find the debris and do forensics, it’s all just conjecture,” the counter-terrorism official said. While there has been rampant speculation about the possible role of terrorism in the missing plane, the counter-terrorism official and other high-level U.S. officials have said so far there is no evidence to indicate that’s the case , beyond an unverifiable claim of responsibility by a little-known Asian extremist group. Rahmam, speaking about the surveillance video, also said, "I can confirm that all security protocols had been complied with." Rahman indicated that investigators were not any closer to determining what happened to the Boeing 777 jet, a plane with an excellent safety record, or where the plane was. Samples from an oil slick off the southern coast of Vietnam determined it was not from the plane. Well, it could have been a very bad mechanical failure - though that is very unlikely. If it was a planned take-down of the flight one would expect someone to claim having done it - or some obvious advantage to an attack on this flight - neither has been done or explained logically. Who and what was onboard are the best clues so far and the two men who used false passports is an interesting lead, but may be a false trail. People use false passports for many other reasons [drug running for one of many]. Sadly, the black [really red] boxes in the planes emit a very weak signal under water and only for about 30 days. If [big if] it is true that the NSA and others can't pick up any 'chatter' about this then it really is a mystery. Personally, I find it hard to believe the NSA after they have cried wolf when there were none, and not cried wolf when there were many, before. Spy satellites would, in my opinion, likely have the best information as to the last position of the plane - but data from spy satellites is not easy to obtain....they don't even like to let it be known what kinds of information and to what level of definition they can detect things. As they certainly track planes and missiles - both day and night - there likely is some information there; but unlikely to be publicly released or released to other governments. Last edited by Peter Lemkin; 03-11-2014 at 08:01 AM. None of this is adding up to anything but a state run black op. The story keeps changing. Tosh is posting some stuff on facebook but we just don't know yet. attempted to testify at his trial but were shut down. Same old MO. That there were 20 Austin Freescale employees on this plane calls to my mind all the dead scientists. But I am just musing here...As we obtain more valid information- (vs MSM) I think a better picture will emerge. I'm pretty sure that there would be debris from that scenario. The black boxes would also easily survive such an event and have in the past. This has a bad smell on it like an expendable selection of people from nations that wouldn't exacerbate the Ukraine crisis being used as diversion.